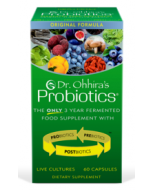 Our best-selling multi-enzyme formulation offers an unusually comprehensive range of plant/ microbial-based enzymes, together with lysozyme, that work in concert to support normal enzyme activities such as digestion of foods and intestinal repair and maintenance mechanisms. 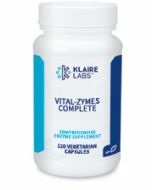 The broad-spectrum combination of enzymes in Vital-Zymes Complete supports the breakdown, absorption, and utilization of macronutrients from a wide spectrum of foods, including proteins and protein peptides, complex carbohydrates, disaccharides and sugars, lipids/fats, and vegetable fibers. As such, Vital-Zymes Complete is an important dietary adjunct for individuals who seek to improve nutrient uptake, and for those with occasional indigestion. 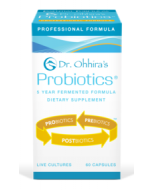 It can also be used for individuals who wish to support a balanced microbiota and healthy inflammation metabolism. Other Ingredients: Vegetarian capsule (hydroxypropyl methylcellulose, water), coconut oil powder, and cellulose. ΔUnits are those used in edition nine (IX) of the Food Chemicals Codex (FCC).